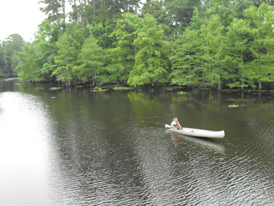 The Walnut Slough Paddling Trail, Sandy Creek Paddling Trail and Neches Paddling Trail are three trails through and around Martin Dies, Jr. State Park that offer a variety of experiences on the park’s backwater sloughs along Spring Creek, the wide open B.A. 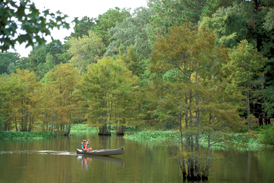 Steinhagen Reservoir, and the fast-moving Neches River, all filled with amazing wildlife watching opportunities. Enjoy 3 to 16 miles of trails, depending on the route you choose! 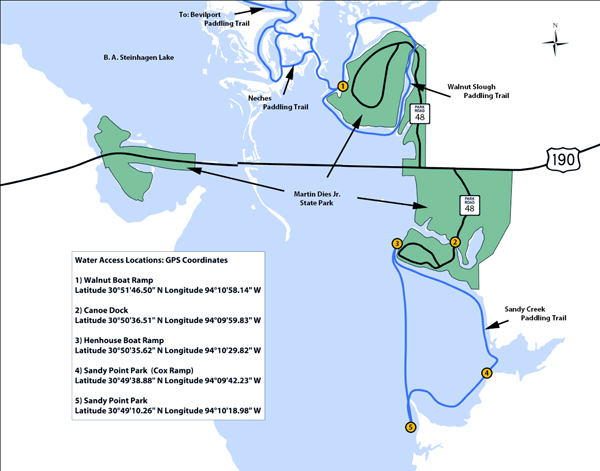 All three access sites are located within Martin Dies, Jr. State Park. The park is located on Hwy 190, between Jasper and Woodville, Texas. Enter the Walnut Ridge Unit (north off Hwy 190) onto Park Road 48, go past Nature Center and shelters, turn right at boat ramp sign. Enter the Hen House Unit (south off Hwy 190) onto Park Road 48, go past park headquarters, and stay on Park Road 48 until you come to the first bridge. This is the Canoe Dock. Enter the Hen House Unit (south off Hwy 190) onto Park Road 48, go past park headquarters, and stay on Park Road 48 past the Day Use Area, and the Hen House Boat Ramp will be on your left. These trails are designed for beginning or novice paddlers, with no shuttle or portage necessary. Following waterways through pristine, old growth river-bottom hardwood forests, you will find a variety of mammals, birds, and reptiles during all seasons of the year. 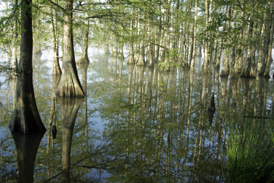 Paddle around mammoth bald cypress trees and experience the slow-moving water of Spring Creek, open water of B.A. Steinhagen Lake, and rapid current in the Neches River. 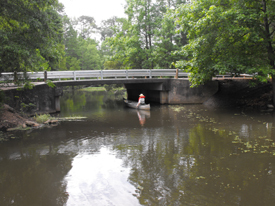 See information on the fourth Martin Dies, Jr. State Park Paddling Trail on the Bevilport Paddling Trail page. Surrounding land for all four Martin Dies, Jr. State Park paddling trails is owned and/or managed by governmental agencies. You will not see cows grazing along the banks or any private residences during your paddling trip. The waterways surrounding Martin Dies, Jr. State Park provide extensive habitats for a large variety of fish. The ever-constant flow of the Angelina and Neches Rivers into Steinhagen Reservoir provides the fisherman with bass, crappie, perch and catfish year-round. Anglers of all ages, using rod & reel and cane poles, catch large numbers of fish from our fishing piers and shoreline, as well as from kayaks and canoes. The slow-moving sloughs and backwaters provide deep holes, whereas the channels surrounding the park provide faster-moving waters, providing a variety of fishing opportunities. The riparian corridors of the Angelina and Neches Rivers support a great diversity of plant and animal life. Birds spotted here include the Swallow-tailed Kite, Anhingas, Belted Kingfisher, and Ibis. Bald cypress trees drip with Spanish moss, while the scaly-barked trunks of the River Birch tower along the shoreline. Common wildlife encountered includes deer, armadillos, and alligators. Martin Dies, Jr. State Park is a 705-acre recreational area in Jasper and Tyler Counties between Woodville and Jasper on B. A. Steinhagen Reservoir (15,000 acres). Visitors can enjoy camping, hiking, boating, canoeing, fishing, swimming, mountain biking and wildlife and bird watching. There are canoes, bicycles, volleyballs, and horseshoes for rent. There are naturalist activities on weekends and outdoor educational facilities. For information on the schedule for these activities, contact the park. The Corps offers 10 primitive campsites along the Angelina River. These campsites are accessible only by boat and are free of charge. 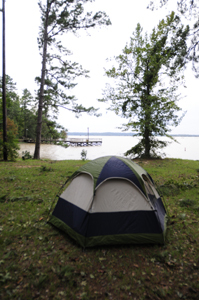 To register for a particular campsite, call the Corps Town Bluff office at 409-429-3491. Heritage Village is a living museum of pioneer history, with a main street right out of the mid-1800s to early 1900s. Walk through an old-time blacksmith shop, check out a railroad depot, visit a livery stable or any of the log cabins. See demonstrations of the old ways. This trail was made possible through a partnership between Texas Parks and Wildlife Department and US Army Corps of Engineers. Canoe rentals, including life vests and paddles on-site in the park.